The Sweet Spot: Life is Sweet! I am so excited because I was able to get, at least, one quiller from each continent. This shows just how popular quilling has become. You can go all over the world and find someone doing it. The theme that I gave everyone was "Life is Sweet." Now, that can really mean anything to anyone. I asked everyone to create something that made their life sweet. It didn't, literally, have to be a sweet, just something that contributed to their happiness. In my case, it is actually literally sweet. My family and I have a thing for cupcakes (if you couldn't already tell from my blog images). We have made up what we've coined as "cupcakes tours" of various states we've visited. I think we have tried the vast majority of the popular cupcake shops here in NYC (and some of the not-so-popular ones). There's just something about those little cute morsels of yumminess that brings a smile to all our faces - especially, since it's become a family affair. I have MANY quilling books. One of my faves is Alli Bartkowski's "Paper Quilling for the first time." At the end of the book she features various quilling artists. I LOVE looking at other quillers' work. In particular, I fell HEAD OVER HEELS with an image of Sherry Rodehaver's "Bakery." (I wish I could find an image to share, but I wasn't able to locate one). I can stare at the picture forever. I've had the book for a while and I even bought a shadow box to attempt my version of a cupcake shop. The shadow box has been in my supply closet for well over a year; and I thought this hop would be the perfect time to get myself together and make my cupcake shop happen. I started working on it on Wednesday, and I soon realized that I had bitten off much more than I could chew. LOL! But, I said I'd challenge myself more so I didn't give up (and I begged my neighbor - and fellow paper addict Andrea - to come help me build my cupcake refrigerator because I was about to throw the whole thing out the window). No worries, it probably wouldn't have gotten ruined since there is SO much snow on the ground here that nothing gets hurt. Ok, ok, I know... you want to see it! I hope you love my little bakery, and that you're ready to see a bunch of amazing projects. 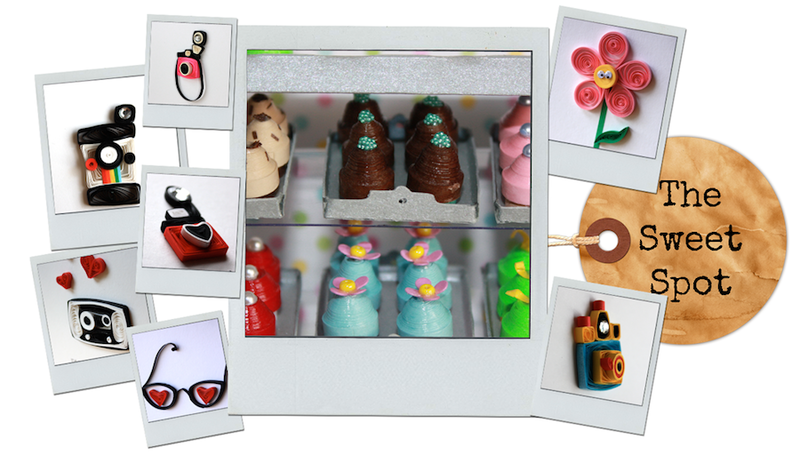 the first-ever quilling blog hop. Special thanks to my wonderful Silhouette machine for doing more than I ever knew it could do (all the background embellishments were cut with it), and to my bestest fellow paper buddy, Andy. (You helped me make my dream come true! (I just got one myself). 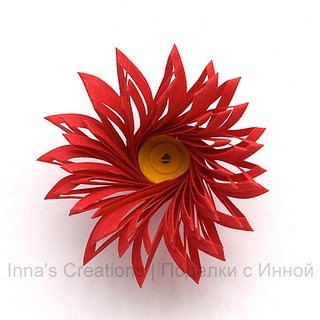 It's a 45-degree quilling fringer. and announced on February 11th, 2011. Check back and see if you've won! Have a SWEET day, and enjoy the blog hop! Sandy!!!! You did a marvellous job!!! Love how you decorated the walls, the colors are amazing and all those cupcakes!!! Yahh!! amazing!!! Have a marvellous weekend !! First of all, I congratulate on your 100th post! Bakery looks delicious! All that toppings, creams...mmmm looks yummy! I'm going to see what's Linda prepared! Congratulations on your 100th post! I love sweets too, for my son it is cookies, for me it is cake, my hubby is cheesecake - lol. Sorry I didn't let you know in time I would have loved to participate! Your cupcake shop is AMAZING! Well done on your work. Adorei o seu blog. Essa fror está muito linda. OMG .. How tiny are these ..
and I got excited and all just looking at your creations ..
"Keep calm and have a cupcake" ... LOVE IT!! Your cakes are gorgeous, Sandy, please save me a chocolate one lol! And thanks for organising the hop - it's such a great way to spend a winter Saturday. absolutely amazing! I just love the miniatures!!! Minis are so cool. The bake shop is so sweet. So much delicate work in that project. The quilling fringer tool makes some great flowers and other things too I am sure. Congratulations on 100! Wow you are so talented blew me away by your design. new to quilling. Congrats Sandy for making it thus far. You're a talented sipota and my Anniversary card is proof of that ;) ... You have a wonderful eye and strong fingers to do all that rolling...LOL! Hopefully one day we can all sit down together and have some great dessert wine (or Patron Cafe) and cupcakes....YOUR ROCK GIRL!!!! the little bakery is so cute! and the little details in the background make it all the more perfect. I'd love to quill like you do. What a sweet project. I could just get lost in there. Your little cupcakes are fabulous. Traveled to all the hop blogs...lots of different projects. So much can be done. Beautiful hop. Thank You for hosting it. Bakery is so cute, love the cupcakes they look so yummy. Your work is absolutly fantastic! WOW! Your bakery is beautiful! I am new at quilling and am thrilled to have found your blog! Thanks for organizing this amazing blog hop Sandy. I am happy I was able to get something ready in time. I'm with you....I love cupcakes and I agree with Philippa - keep calm and have a cupcake - had me laughing. You might just see that on one of my cards someday. What a wonderful hop. Thank you for organizing it. I found some new blogs to enjoy. Wonderful creations at each stop!!! Congratulations! The cupcake bakery is amazing. I love it, because I am a cupcake maker myself. You have outdone yourself, great job. Congratulations on 100 posts. and congrats on having a world wide hop. Thanks for letting me share the journey. 3d quilling has always intrigued me, you did such a great job. BEAUTIFUL!!!!! loved the details on the cupcakes...wanna make me go to the new Sprinkles cupcake bakery, that recently opened here in san diego to celebrate your 100th post..LOL!!! Really sweet Sweet Shop, Sandy - lots of detail! Congratulations on your 100th post - it's been fun getting to know you. Congrats for the 100th post! Love the celebrations. What a fun Blog Hop this has turned out to be Sandy...I really admire your work, you have become one of my favorite Quillers.. your work is just Amazingly beautiful and ohh so inspirational. Thank you again for putting this hop together and the shout out. You are Amazing my dear friend! Hugs, Hugs and more hugs...and Congrats on your 100th post. Your cupcake bakery shop is AMAZING!!! :) I am soooo impressed!!!!!!!!!!!!!!!! I wish that was the blog candy you were giving away-it is too cute! Thank you all for your comments. It was fun travelling "around the world" and seeing everyone's projects. Comments will be left open until February 11th to qualify for the candy. @Jennifer: I dunno if I'll part with this one. It's really close to my heart. But thank you for the compliment! Sandy, I am not a paper-guru like the rest of you but I can spot a great interior when I see one and your little cupcake shop is spot on! love, love, love the contrast of colors and textures and those mini cupcakes are divine. Absolutely Adore! OMGoodness!! I don't even know where to begin. This is so wonderful work. I'm totally amazed. TFS and the chance to win. 100% AMAZING! I told Linda earlier today that when I saw this, I didn't even know it was paper! I am now a follower of your amazing blog! This "takes the cake" on our blog hop. Oh my gosh!! I've never seen quilling like this!! It's awesome!! Thanks for sharing!! Okay...as I listen to a Sarah McLalahn(sp?) commercial and just listened to your video you posted of her...I had to stop in and tell you how amazing your quilling is! I have some treasured ornaments I bought at a bazaar years ago...I love how delicate each piece is! Sandy...thank you so much for including me in this wonderful blog hop. I love it so much!! I'm so glad I was able to participate in it! Do count me in if you ever plan on doing another one hehe! Love your quilled cupcakes...they are so amazing!! I've never attempt at making 3D quilling before...I'm so inspired now just by looking at your work! This is by far the most gorgeous work I've seen so far in this blog hop!! Amazing job! I esp loved all the details. Thanks for sharing. WOW!! I am your newest follower, because your work is soooo inspiring! Just started quilling and I didn't realize how much you can do with it, Spectacular job!! Your 3D quilling is amazing! Thanks for organizing the hop, I had so much fun. Your bakery is adorable. You are very talented. Thanks for sharing. I love your cupcake shop! So cute. I just love your cupcake shop. Thanks to Ann Martin for pointing the direction to the "blog hop", on her "All things paper" blog, I'm so excited about all these links. So, I have an idea! What if you open a "Sweet Spot Cupcake & Card Shop" ? Oh... can you imagine?! It would be the perfect spot to buy sweet stuff! (cupcakes & cards). Your shop would be inundated on Valentine's day. I got here from Ann's post, too. I really love the little tables on top - it really adds some interest.